UofL leaders and financial supporters take a sledgehammer swing to mark the start of renovation. 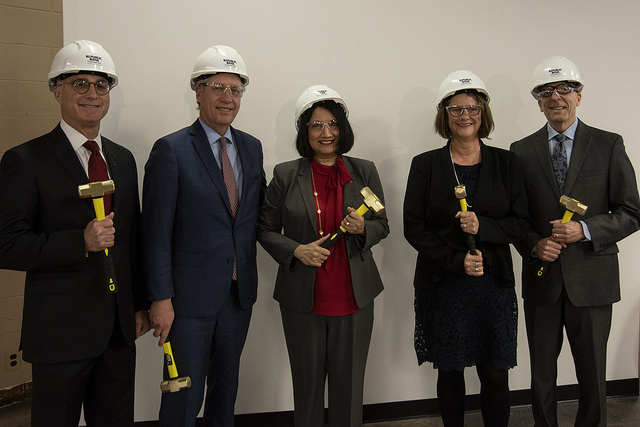 With the ceremonial swing of sledgehammers, renovation has begun on the new home of the University of Louisville Trager Institute at 204 E. Market St. Formerly the Institute for Sustainable Health and Optimal Aging, the Trager Institute will expand into the new space thanks to generous gifts from the Trager Family and Republic Bank Foundations. “Considering the importance of the eldercare industry to Louisville’s economic development, we are proud to partner with the University of Louisville. It is our hope that this gift will help develop a world-class conduit that eldercare companies can partner with in research, innovation and career development. Additionally, local citizens will become beneficiaries of the Institute’s efforts through the newly established Republic Bank Foundation Optimal Aging Clinic,” said Steve Trager, chairman and CEO of Republic Bank. “With this new facility, we will be able to conduct research and provide care in ways that transform our understanding of health care and aging. 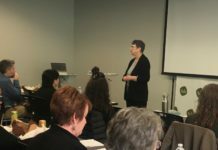 We are working to change the way health care is provided and focus on integrating lifestyle medicine that has shown to provide extraordinary benefits to achieving optimal aging,” said Anna Faul, PhD, executive director of the Trager Institute. Multiple financial supporters are key to the successful work of the Institute. The clinical practice is bolstered by the financial support of John Wright, MD, a geriatrician and professor emeritus of the UofL Department of Family and Geriatric Medicine.